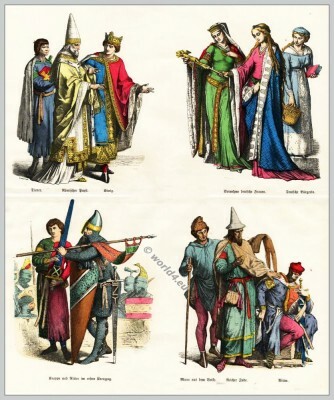 Middle Ages fashion history in Germany. 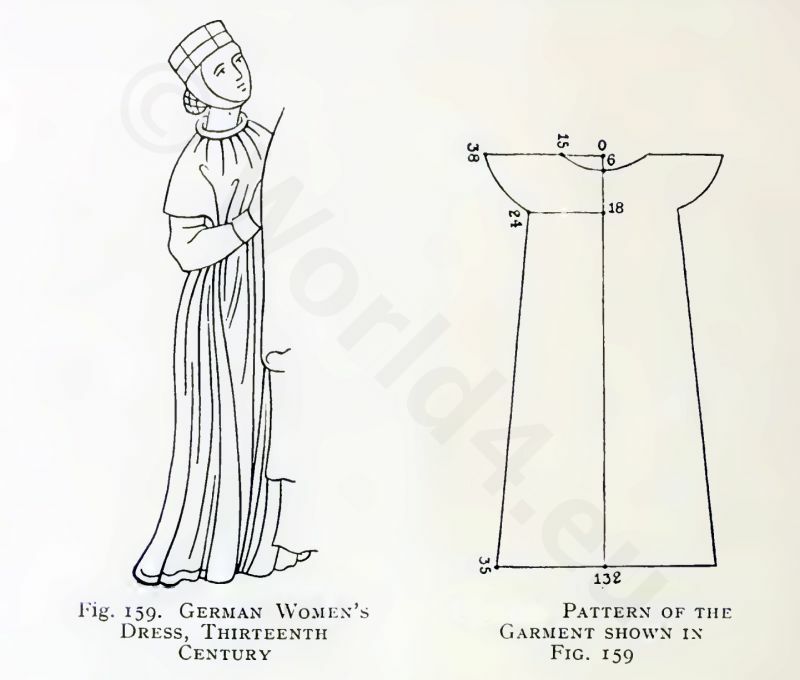 Home » Middle Ages fashion history in Germany. 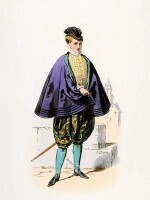 Dress of the citizen, peasants and nobility. THE costumes worn in the Middle Ages were based on the types that had been evolved about the middle of the first millennium from the intermingling of native fashions with those of later antiquity. 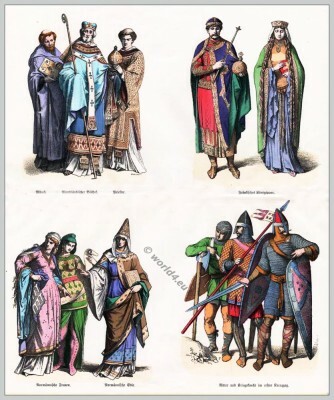 In the first centuries after the migration of the nations (A.D. 600) there was little difference between the styles of dress current among the various nations of the West. Then ensued a period of separate development, each nation following its own tastes, and this lasted until the Crusades brought all the peoples of Europe into close touch with each other and reintroduced a greater measure of uniformity. This uniformity, however, was greatly enriched by the fruitful influences of ancient Oriental civilization, particularly in respect of material and ornamentation. 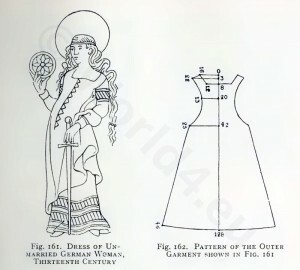 There is a very close connexion between the styles of the early Middle Ages and those of ecclesiastical dress. The latter has retained down to our own day survivals which enable us to form a clear conception of the costume of the Middle Ages. Unfortunately, we possess very few original garments belonging to this long period. One of them is the white silk dalmatica that belonged to the Emperor Henry II which is among the treasures of Bamberg Cathedral. Samples of material and inwoven patterns are more numerous. It helps our imagination when we look at the miniatures in ancient manuscripts and the tombs that still exist. And in quite recent days the discoveries made at Herjolfsnes, the ancient Norse colony, have brought to light a number of garments that reveal the dress of the later Middle Ages. These are so perfect that they constitute a source of inestimable value for the history of European dress, even although these Norse settlers were limited in their choice of material by the remoteness of their situation. 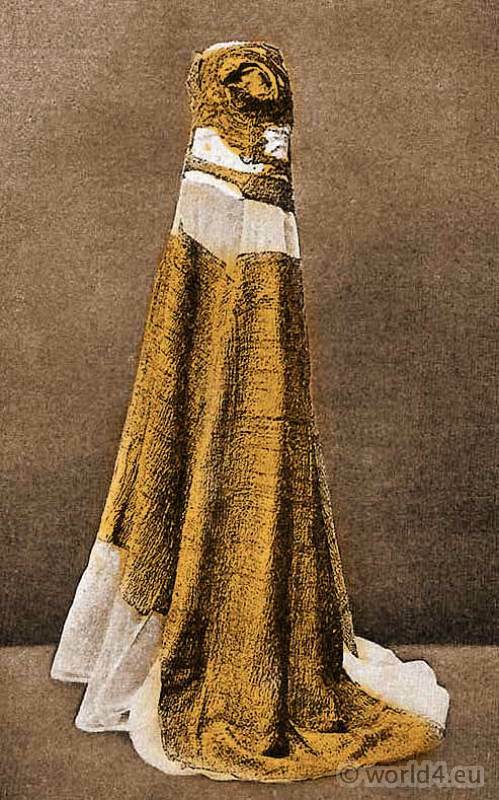 Equally interesting is the golden dress of Margaret of Denmark, belonging to the second half of the fourteenth century, with the extraordinary length of the front of the skirt and the extreme shortness of the bodice, which was fastened at the back. The beautiful material—cloth of gold shot through with a dark red-violet colour—helps us to imagine the rare splendour and beauty of the royal robes of that time. To the period between fifty and seventy-five years later we must ascribe the coat of carmine red satin which is said to be part of the spoil from the battle of Grandson in 1476, and is now in the Museum of Bern. It looks like an under-garment meant to be worn beneath the robe — an overgarment of heavy, rich material. It is said to have belonged to Charles the Bold of Burgundy, whose Court was one of the most brilliant of his time and powerfully affected the development of contemporary fashions. To complete our conception of the dress of the Middle Ages we must add the jewellery. It was both beautiful and valuable, and fortunately numerous specimens still exist. 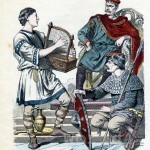 Especially charming are the examples of the goldsmith’s art which belong to the zenith of the Middle Ages—the time of the Ottos and the Henrys. Their high perfection of technique is a constant delight. The breast-ornaments of the Empress Gisela, which belong to the year 1000, together with her earrings and clasps, bear eloquent testimony to the outstanding skill of the craftsmen and the cultivated taste of those who employed them. 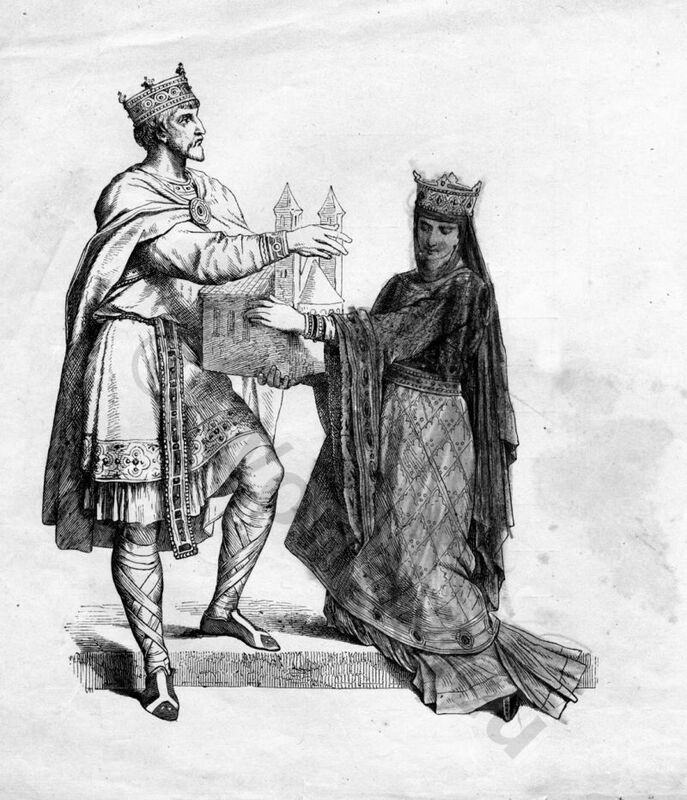 German King and Queen of the Franks. 10th century. 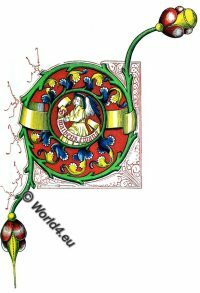 The jewels combine the strength of the Carolingian genius for design with the delicacy of Byzantine technique, and they are among the finest things of the kind in existence. The ancient Teutonic fondness for gold and precious stones, which had already been shown in the brooches and clasps of an earlier day, finds eloquent expression in these jewels. Battle of Grandson took place on 2 March 1476. 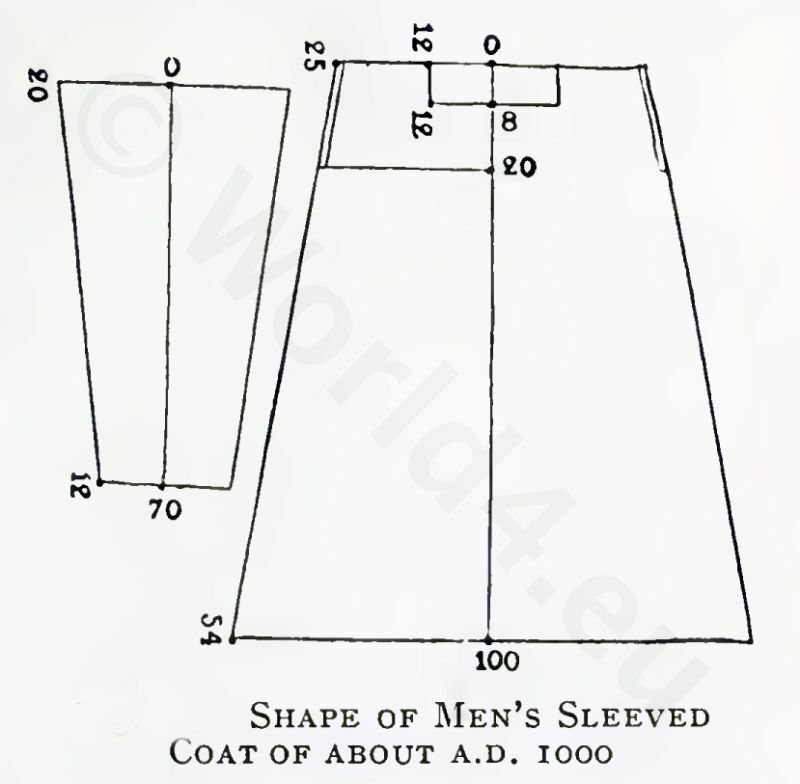 At this period men were wearing a fairly wide tunic of varying length, girdled at the waist, and having sleeves that covered the whole arm down to the wrist. It was no longer unusual, although it was still far from being the universal practice, to wear beneath this tunic (which was generally made of wool, but frequently of silk) a linen shirt. This was worn next the skin. 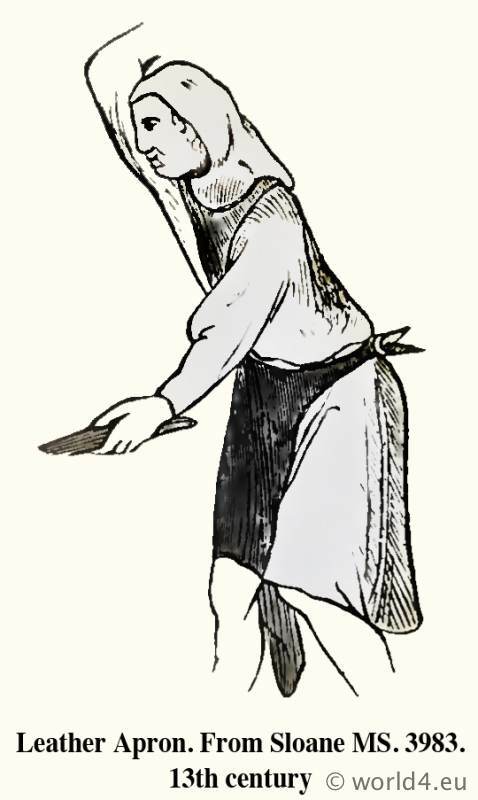 Over the tunic was worn a cloak, usually oblong in shape, which was thrown over the left shoulder and gathered on the right by means of a clasp (agraffe). Finally, men also wore leg-garments of varying length, and over these was drawn the footwear, mostly of eat her and reaching up to the calf. The cut of all these garments was still in all essentials the same as it had been for centuries that is to say, the coat consisted of two similar pieces, back and front, sewn together down the sides and on the shoulders. The sleeves were straight, with only one seam, and narrowed gradually from the shoulder to the wrist. The opening for the neck was fairly wide, sometimes rounded, sometimes square, and was cut in the front piece. The coat was usually made of bright colored material, and wide strips of braid or other stuff were sewn round the foot, the neck, and the wrists. The shirt was shaped like the coat, but it was usually wider, and always much longer, often reaching as low as the ankles. 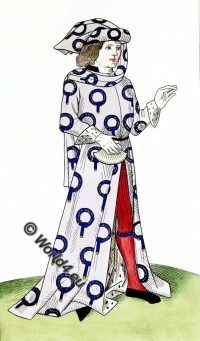 The cut of the cloak was rectangular, the length of the narrow sides being equal to the distance from the wearer’s neck to the middle of the lower leg, and about a third less than that of the long sides, which made the width of the cloak. The leg-garments were long stockings, made of two pieces shaped like a leg and sewn together at the front and back. The lower part of the shirt was tucked into these; they were attached to a girdle (worn under the coat) by means of tapes sewn on the outside of them, and were thus held in position. Beneath these stockings many men wore long, wide under-hose of linen, somewhat like two bags sewn together in the upper part. Footwear consisted either of ankle-high shoes or boots that came up to the middle of the calf. 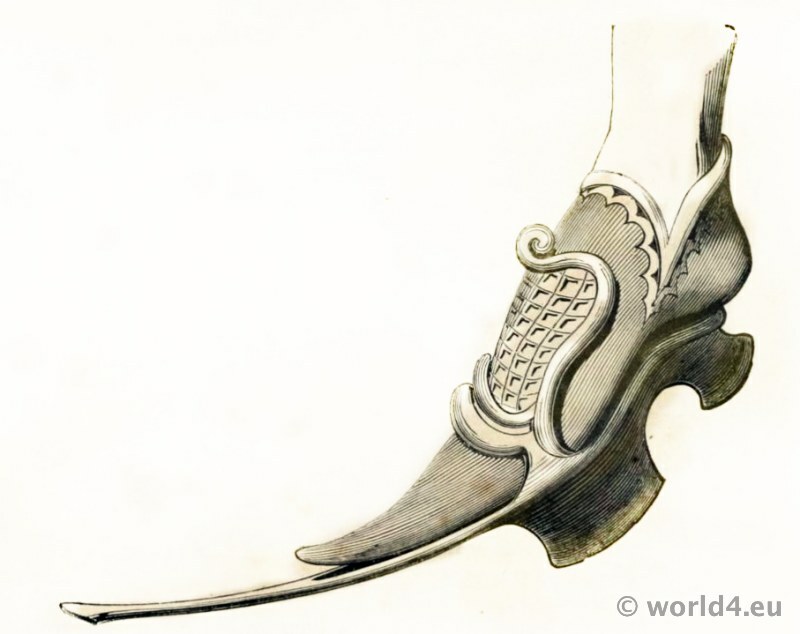 Poulaine Shoe of King John II. of France. 14th century. The usual female dress consisted of a long chemise of linen or hemp, with a low neck and short sleeves. Over it came the coat, or tunic, which had the same shape as the chemise, and reached from neck to feet. It had long, tight sleeves. These coats, like those of the men, were trimmed with wide strips of colored braid at the neck and wrists and round the foot. 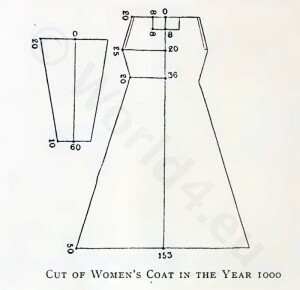 Over the coat women wore either a cloak fastened at the middle of the breast with a clasp or a garment similar to that underneath, but shorter and with shorter sleeves. This over-garment was usually worn ungirt, but many women, if they were wearing only one garment, gathered it round them with a girdle. The only difference between these coats, or tunics, for the two sexes was that those of the women were longer and not quite so full. Further, apart from slight variations, such as the low neck of the chemise and the short sleeves of the garment worn over it, all the items in the woman’s wardrobe were of the same shape. On the whole, women’s garments were made in the primitive way. The front piece was joined to the back piece (which was narrower at the height of the breast) by seams on the shoulders and at the sides. The sleeves were straight, and had but one seam. The cut for the neck was invariably made in the front piece. From the middle of the thirteenth century onward some changes appeared in the fashion of men’s clothes. To the coat was added a hood which could be pulled over the head in rough weather. 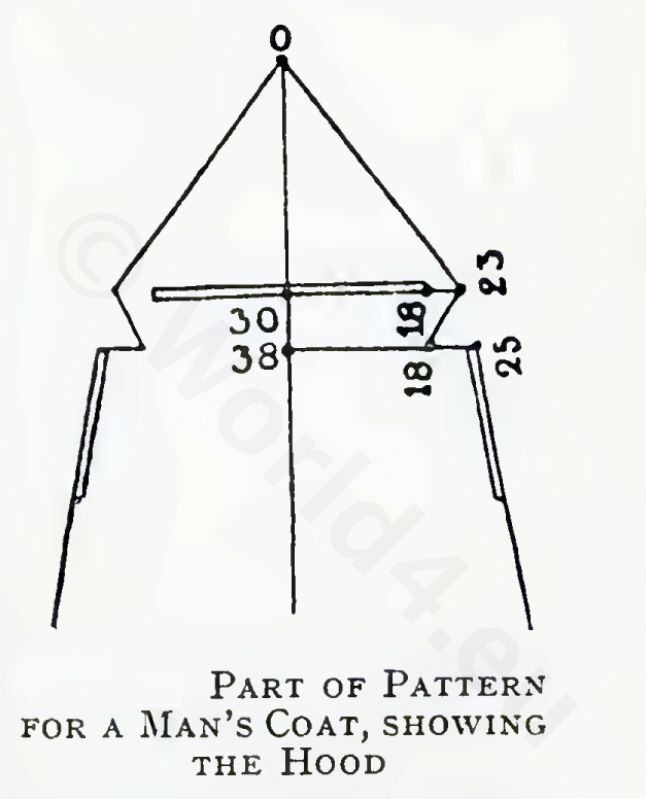 This hood, which was more or less pointed, was cut in one piece with the rest of the coat and sewn at both sides. An oblique cut in front not only left the face clear, but served to let the head through when the hood was thrown back. Again, the opening for the neck began to be made considerably smaller; a slit at the breast was introduced, and so arranged that it could be fastened with buttons or hooks. About this same time—the middle of the thirteenth century actual over-coats began to come in. They resembled the ordinary coats, but were fuller and shorter. The chief difference lay in the great width and length of the sleeves, through which an opening was made to allow the passage of the arms. 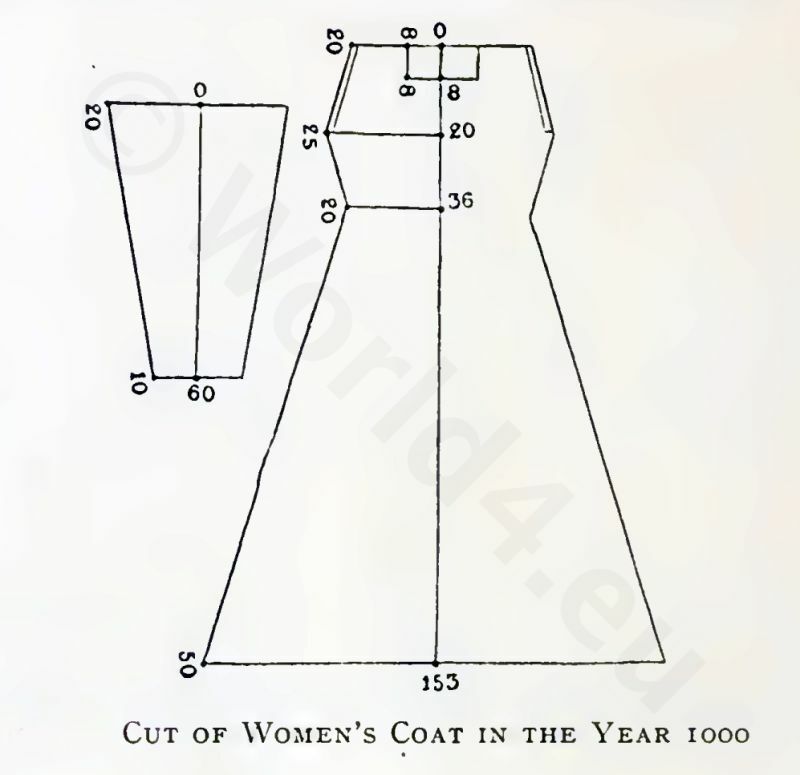 These over-coats were usually provided with a hood. 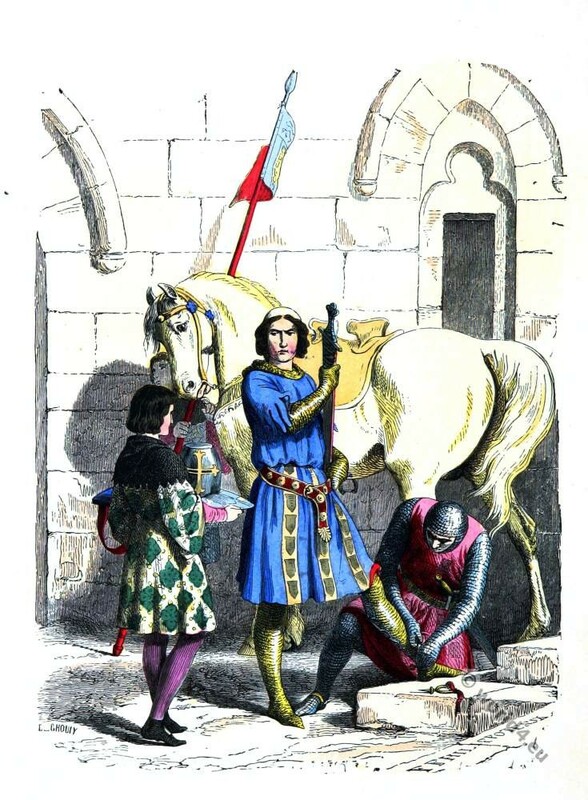 The thirteenth century saw little change in the garments for the leg, except that the stockings were made longer and fastened more firmly to the waist-belt that held them up. 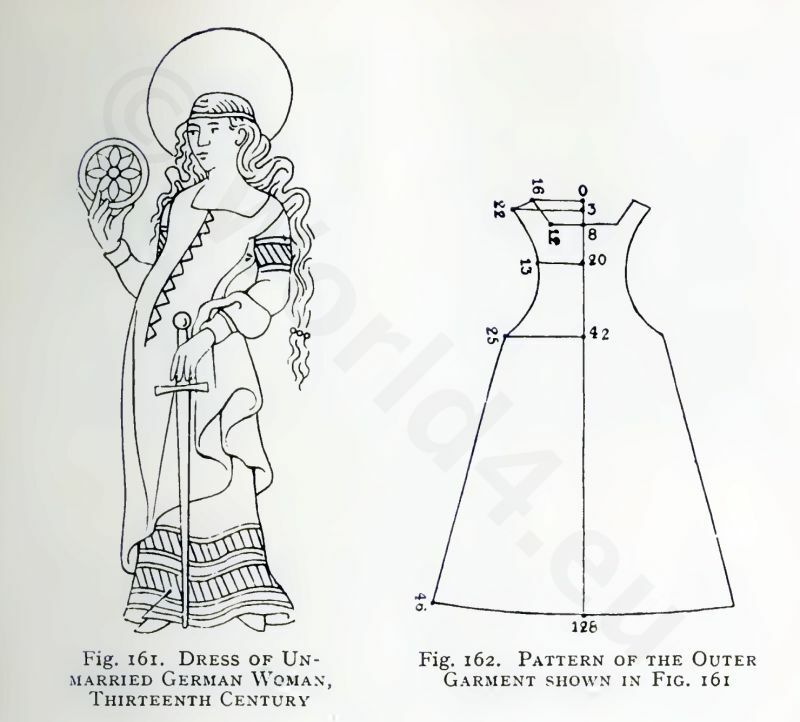 In the eleventh century women’s dress had altered but slightly from the fashions that had formerly prevailed. The chief variation affected the upper garment of the higher classes. It gradually became shorter, while the sleeves were much longer and fuller. They came at least halfway down the forearm, and frequently to the wrist or even further. They were widest at the lower end; at the upper end they were no wider than the thickness of the arm required. One kind of sleeve widened gradually from top to bottom; another widened suddenly down near the hand. The seam in the sleeve was no longer on the under side, as before, but was shifted a little toward the back, so that if two seams were necessary—as was the case when the material was narrow—the top seam was a little toward the front and the under seam toward the back. 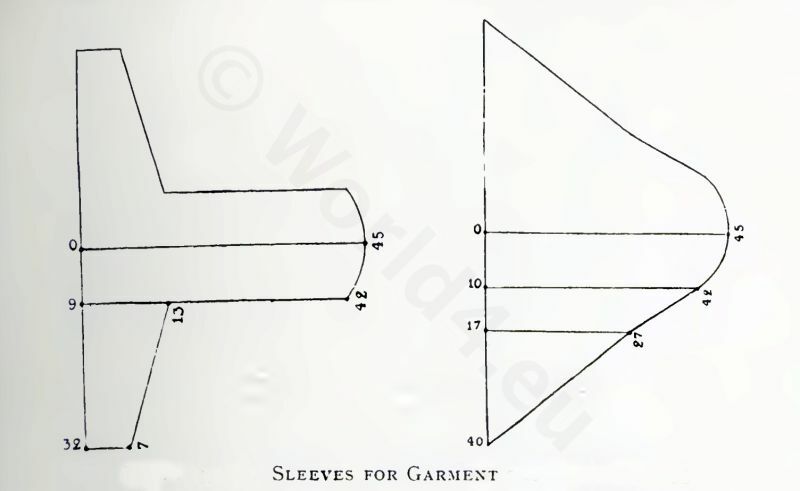 At the same time the under part of the sleeve was shortened at the top. 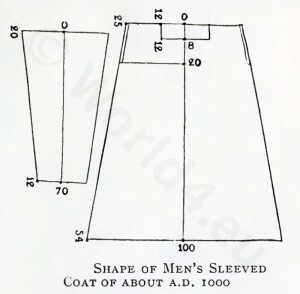 In other respects the over-garments (two of which were often worn together, in which case the outer one was shorter than the other, and the second only had the sleeves very wide at the lower arm) followed the fashion that had previously been current, except that they were now considerably tighter than before. 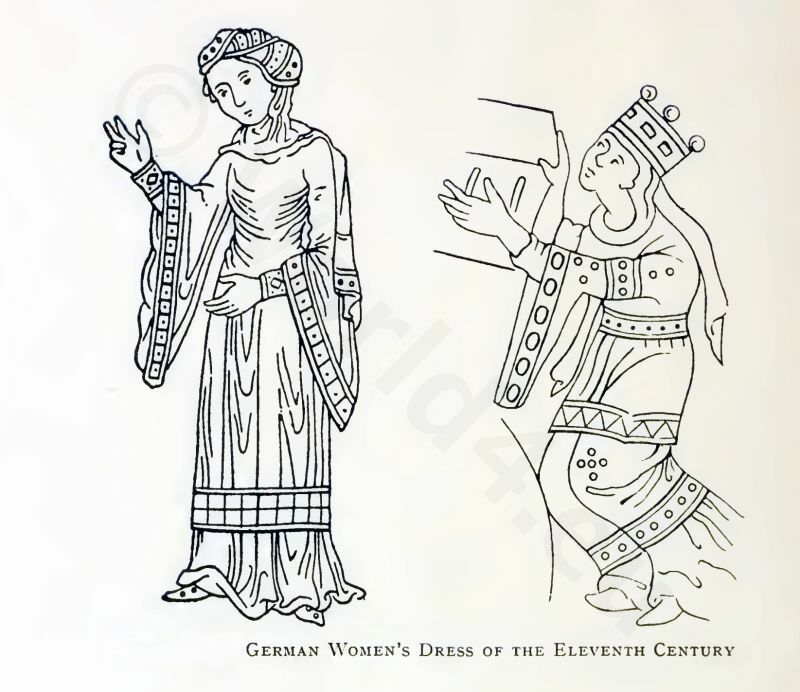 German women`s dress of the 11th century, middle Ages. 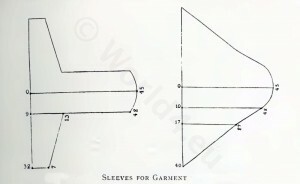 Sleeves for Garment shown in left Fig. 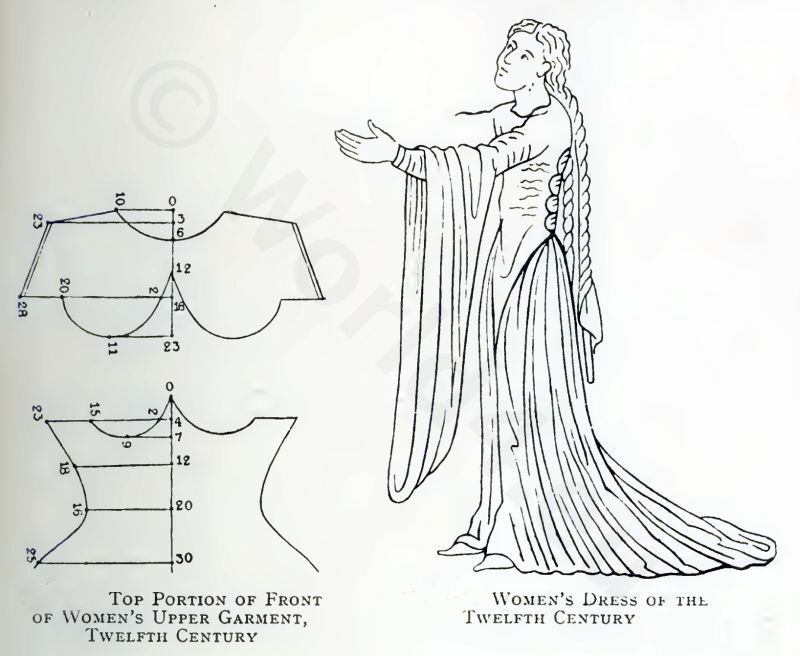 About the middle of the eleventh century clothes began to be made so close-fitting that they followed the lines of the body from shoulders to hips like a glove. 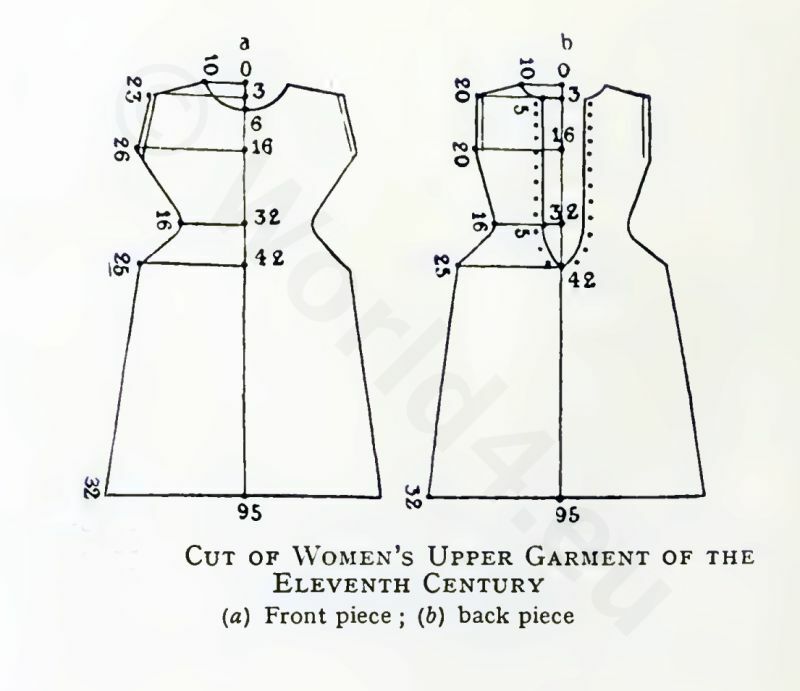 In order to achieve this result the back piece of the garment was divided from the neck to the fork, and the edges of this cut so arranged that they could be tightly laced. Further, the front and back pieces were both shaped to fit the body. 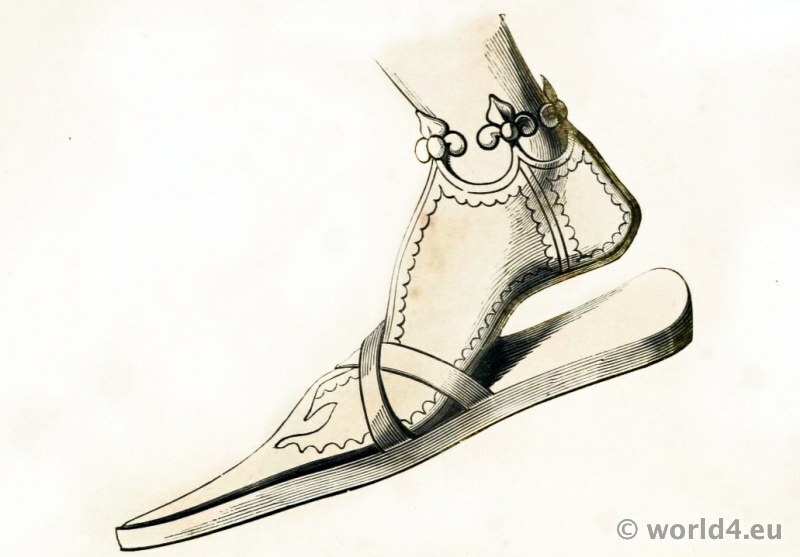 These garments were usually worn ungirdled, but they were ornamented with strips of braid round the foot, at the wrists, and sometimes at the neck. The under-garment had retained its earlier form, except that it was now so long that it trailed on the ground ; while the sleeves were still trimmed at the wrists, the foot of the garment was now left plain. 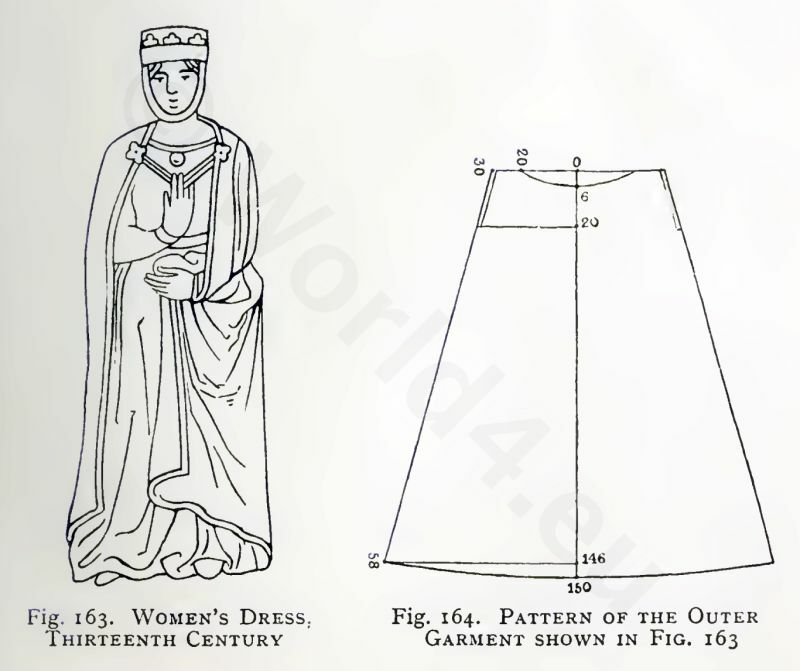 In the twelfth century women continued to wear the same style of under-garment. The over-garment, which was now much worn by middle-class women, as well as by those of higher standing, was much longer, and frequently trailed on the ground. Sleeves were now longer, and the width at the wrists had increased; the upper part of the garment was now even more close-fitting than before. Over- and under-garment were occasionally of the same color, but as a rule they were made of different or at least differently colored material. Trimming on the over-garment was rare save at the wrists and half-way up the upper arm. The foot of the skirt was now hardly ever trimmed. The sleeves of the under-garment usually had colored braid at the wrists. 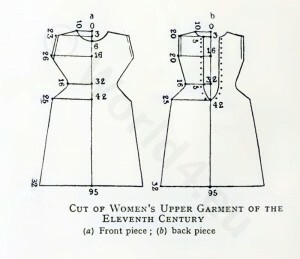 When the under-garment alone was worn, as in the case of the lower and working classes, its lower edge continued to be trimmed, and occasionally also a wide strip of braid was sew down the front from the girdle to the foot. 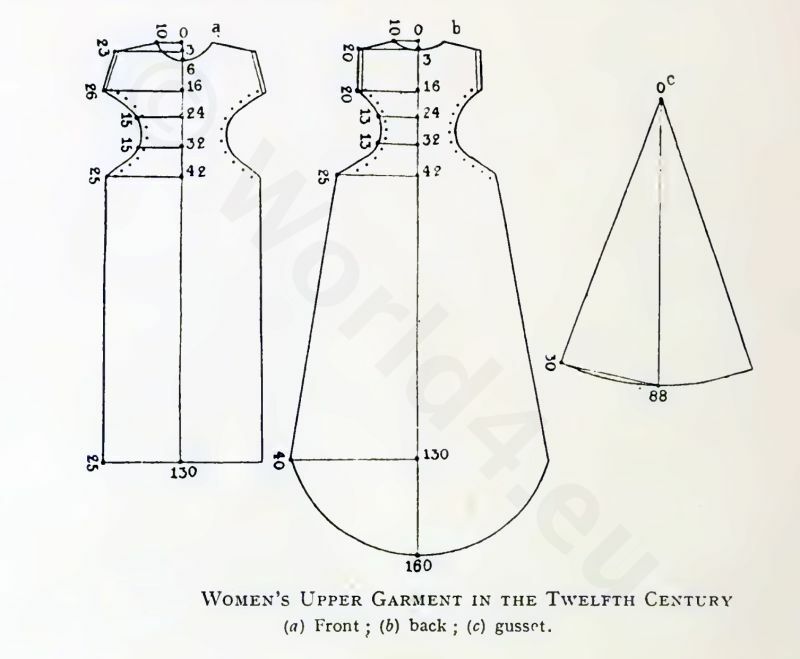 Women`s upper garment in the 12th century. 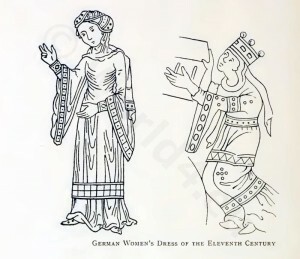 German women`s dress, 13th century. On the other hand, the fashion of the over-garment had considerably changed. Owing to the tightness at the waist, the great width at the foot could be retained only by inserting at both sides a large gusset between the front and back pieces. The upper part was made as close-fitting as it could possibly be, and was arranged for lacing either at the back or down both sides from armpits to hips. The under-garment was exposed—usually at the sides. 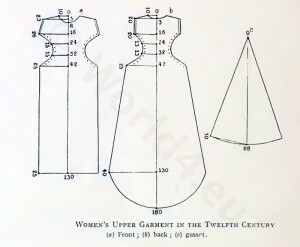 Further, in order to emphasize the outline of the breasts the front of the overgarment was made in two pieces, the lower one being cut away each side, so that a peak ran up between the breasts. At the top was sewn a piece of material longer and broader than the excisions, and this fell from the neck to the breasts. By sewing together these two pieces from the peak toward both sides, bag- or purse-shaped enlargements for the breasts were produced. The fashion for the sleeves continued as in the eleventh century, except that they were now made very much wider at the wrists. The under-garment remained as it had been for centuries, except that the neck was lower and sleeve-holes were cut. The over-garment was now usually worn without a girdle, but the under one was still girdled, especially when the wearer had no other on. The lower classes made the under-garment of wool or linen; the Upper classes usually used silk. It was the dress for indoors, and when no other garment was worn it was usually supplemented by a neckerchief. The low neck rendered this almost necessary. As headgear they were wearing the Chaperon, also called the Gugel by the lower classes. 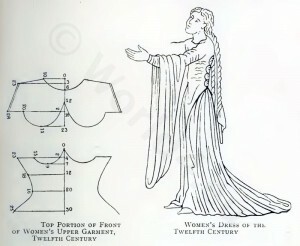 The thirteenth century brought in extensive alterations in women’s dress. Not only were the items in the wardrobe made lower at the neck, but in other respects also there were considerable changes in their shape. The most striking of these affected, as before, the over-garment. The coat style was almost entirely abandoned, and a simple wrap was substituted. The first step toward this revolutionary change was taken when sleeves were discontinued, for this occasioned various other alterations in the cut of the whole garment. 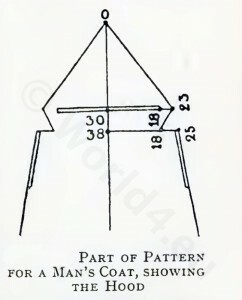 The new fashions for the sleeveless dress called Suckenie, or Sukni — can bereduced to three main types, which were followed concurrently for a considerable time. First there was the very long dress, closed all round, and growing gradually wider from the top downward. It was pleated at the neck, but in other respects was of simple cut. Front and back were shaped alike, except that the top of the back was slightly narrower. The second style was very wide over the shoulders so that it fell to the middle of the upper arm. Dress of unmarried german woman, 13th century. It was much tighter across the breast, widening toward the foot. Front and back were sewn together only at the shoulders, so that the sides were quite open. The neck had a wide hem, and through this was passed a ribbon, by means of which the neck could be adjusted to the liking of the wearer. The third style was principally worn by girls and unmarried women. It combined features taken from the other two; the sides were open as far as the hips, but closed below that point. These over-dresses, cotella, or cotelettes, as they were called, were very popular at the close of the thirteenth century. Like the two styles already described, they were always worn without a girdle. In this third style also the back and front pieces were shaped alike. 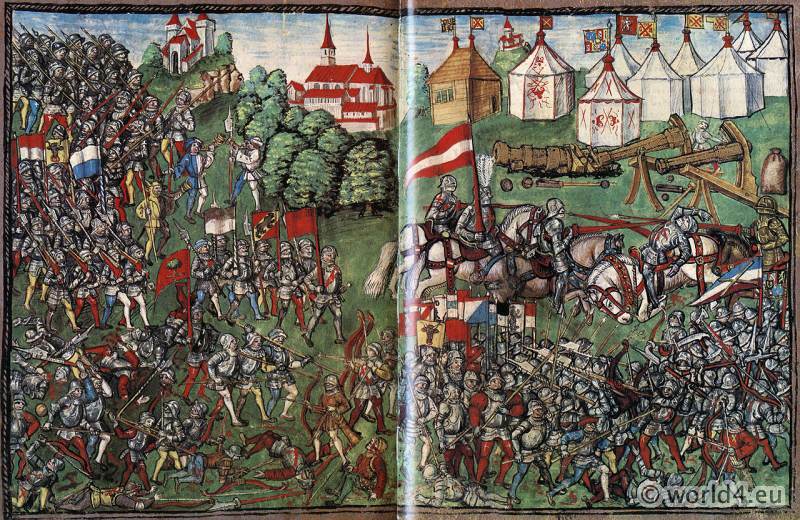 The under-garment of the thirteenth century retained the shape it had had at the end of the twelfth. It was very long, fairly close-fitting from the shoulders to the hips, and increased in width down to the foot. The sleeves were long and tight. Round the neck and the ends of the sleeves colored braid or threads of gold were sewn. Sometimes a girdle was worn with it and sometimes not. Women of the upper classes often wore an agraffe, or clasp, at the breast. 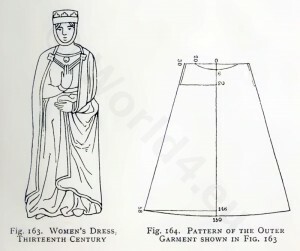 Most of these garments were of material in one color only, but some women, especially of the servant class, had them made of several pieces of different material and of different colors. The color, however, was not a matter of arbitrary choice. It indicated the colors of the coat of arms of the wearer’s mistress. Toward the end of the century it became the fashion for the mistresses themselves to dress in the colors of their coats of arms or to have these embroidered on their clothing. During the thirteenth century there was little change in the cloak. The shape continued to be semicircular or nearly so, and it was put on as before. 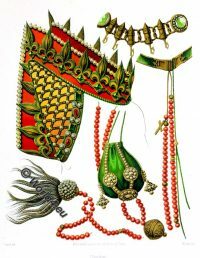 To keep it more securely on the shoulders, however, a single or double string crossed the breast, and was fastened to the cloak at both sides by means of clasps. This string was not drawn taut, but was allowed to hang loose in an ornamental way, and ladies frequently held a finger or fingers on it to tighten it. The thirteenth century found women still wearing their hair loose in the ancient Teutonic fashion. Occasionally they parted it into separate strands and tied each with ribbon. 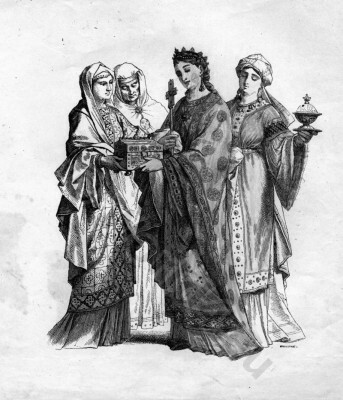 The veil-like kerchief which had been worn on the head in the Carolingian period was discontinued, and was replaced by a garland of flowers or a circlet set with precious stones. This circlet was soon exchanged for other forms, such as a crown or a coronet. The young girl wore flowers in her loose, flowing hair. Matrons wore a cap that fitted tightly round the head and was fastened under the chin. 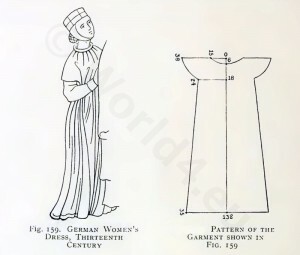 Source: A History of costume by Carl Köhler. Edited and augmented by Emma von Sichart. Translated by Alexander k. Dallas M.A. Lecturer in German In Heriot-Watt College Edinburgh. Charles II the Bald. West Frankish king 9th century. 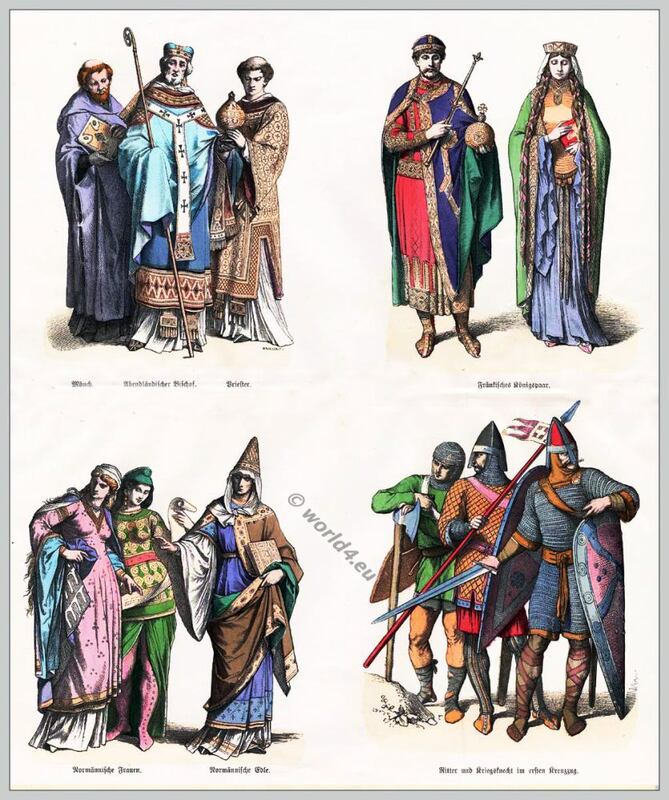 This entry was posted in 11th Century, 12th Century, 13th Century, Burgundian dress, Byzantine, Carolingian, Fashion History, Germany, Middle Ages and tagged Burgundian fashion period, Carl Kohler, Gothic costumes, Medieval costume on 3/5/13 by world4.